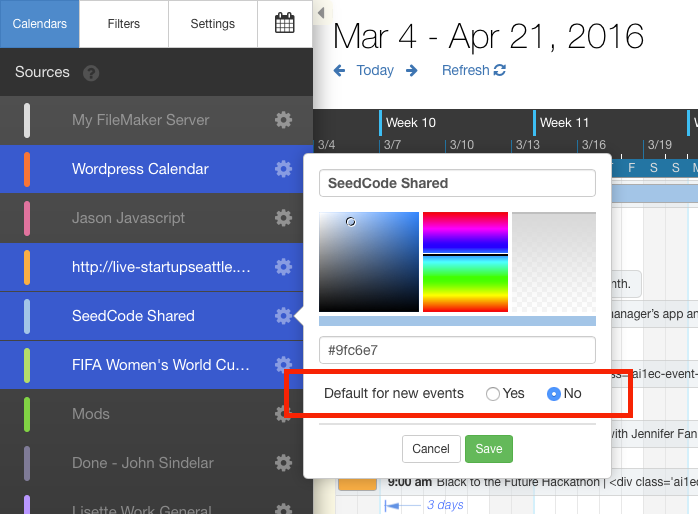 Double click on any empty area in the calendar. You'll see a green button to make a new event. If only one source is visible (is turned on in the Sources tab) then we create the event in that source. If multiple sources are shown, and the default source is among them, we use the default source. If multiple sources are shown, and the default source is NOT among them, we use the first visible source is not a read-only calendar. Can I make event records from outside the calendar, such as from portals on my other layouts? Remember that DayBack is just a window on to Salesforce (FileMaker, or Basecamp) records you already have, so for any objects you've asked to see in the calendar you'll see those objects whether they are created in DayBack calendar or in your own application's pages. There is no "sync" between some database of DayBack events and your Salesforce, FileMaker, Google, or Basecamp objects: DayBack is reading and writing your Salesforce tables directly, exactly like your other Salesforce pages do.